I believe there are many lessons to be learned from the trees, among them is how we can find our own strength and value. Magnificent trees start from a nut which escapes from its shell, begins to root itself in dirt, and somehow, thrives, to grow strong and large. Trees weather the seasons, blooming when it's time, shedding the old and spent when it's time, sleeping when it's time, and renewing, growing and spreading more, when it's time. There is no attachment, there is no jealousy, there is no good or evil, there just "is" amongst the trees. Yoga can be found in the trees. It's the bringing together of what stabilizes us and what keeps us going and growing. The term "Hatha" refers to the physical practice of yoga -- the postures and poses, also called asanas. Hatha means "willful" or "force," according to "Yoga Journal." 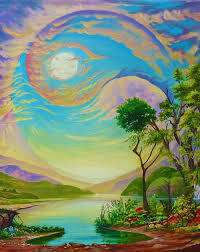 It is also translated as “Ha,” which means sun, and “Tha,” meaning moon; so Hatha becomes balanced by uniting opposites. It is believed in many yoga traditions that energy that is stuck in some way can lead to both mental and physical diseases.The physical practice serves to strengthen your muscles, increase flexibility and open the various channels in your body to allow energy to freely flow. of "unionizing" the body and mind with me, Julia Calabrese-Harrer. I offer private, semi-private, and class sessions. for class information and times. for more information on services and classes offered.